Kevin Durant continues to strengthen his case for his first MVP award. SAN ANTONIO — Teams are finding out there’s little they can do to stop Kevin Durant. Durant had 36 points to offset Tony Parker’s season-high 37, and Oklahoma City survived a testy 111-105 victory over San Antonio on Wednesday night, their third win this season over the defending Western Conference champions. Durant is averaging 38.1 points in his last 11 games, helping the Thunder reclaim the Western Conference’s record with a five-game winning streak and an 8-3 mark. ”Kevin did his thing down the stretch, it was pretty remarkable,” San Antonio Spurs coach Gregg Popovich said. Reggie Jackson gave Durant all the help he needed, matching his season high with 27 points while handing out eight assists. Jackson had 11 consecutive points early in the fourth, blowing past Parker for layups to give the Thunder a 94-89 lead with 8 minutes left. Durant bounced up and down excitedly after his second 3-pointer of the quarter gave Oklahoma City a 108-98 lead with 1 minute remaining. Duncan and Boris Diaw scored 14 points each, Marco Belinelli had 13 points and Manu Ginobili added 10 points. Duncan added 13 rebounds, but San Antonio (32-10) struggled to overcome the loss of their top defensive stopper, Kawhi Leonard. Durant finished 12 for 22, but struggled to get his shot off against the snug defense of the 6-foot-7 Leonard, who has a 7-4 wingspan. Leonard left the game late in the first half after sustaining a non-displaced fracture in his right hand. His status is unknown, but a similar injury is expected to sideline Danny Green for a month. Durant scored 24 points after Leonard left the game with 3 minutes left in the first half. With Leonard out, the Spurs rotated Belinelli, Ginobili and 6-3 former Texas Longhorns teammate Cory Joseph on the 6-9 Durant. San Antonio even attempted a zone at one point to slow Durant to no avail. The Spurs used a physical defense against Durant with Leonard out, especially when Ginobili drew the assignment. 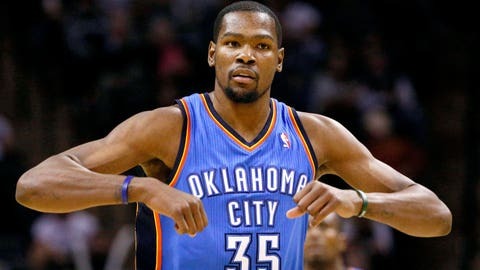 The tough play angered Durant, who twice lowered his shoulder and dropped Ginobili. Both plays resulted in non-calls, which incensed Popovich. The Spurs coach screamed at officials while Durant appeared to yell at Popovich. Popovich was assessed a technical foul, which Durant angrily sank with 1:12 to give Oklahoma City a 55-51 lead with 1:19 left in the first half. Durant dismissed the heated emotion just as quickly as he did any psychological boost the Thunder will get from beating the rival Spurs three times. San Antonio is 1-9 against the West’s remaining top-five teams and the East’s best, Indiana, but they have bigger problems now. After remaining relatively healthy in reaching the NBA finals last season, the Spurs have been plagued by a rash of injuries in the past month. Leonard joins starting center Tiago Splitter and former starter Green on the injured list. Parker is also still has a bruised shin that limits his mobility and long-range shooting forward Matt Bonner has to wear a mask after breaking his nose Friday against the Portland Trail Blazers. Parker had 20 points in the second half, including 12 in the fourth quarter. ”Offensively, Tony was great, but he needed some help for a little while and we just did not get it to him,” Duncan said. There were four lead changes and six ties in the third quarter, but Oklahoma City never trailed in the fourth. NOTES: Splitter (sprained right shoulder) and Green (broken left index finger) both missed the game. . . . Oklahoma City is 10-4 in back-to-back games, including a 4-3 record on the second night. They have swept three back-to-backs this season. San Antonio has a 54-22 record at home over Oklahoma City. . . . Bonner, the Spurs’ fun-loving forward, is playing along with the ribbing he is getting about the mask he must wear to protect the broken nose he sustained Friday against the Portland Trail Blazers. Duncan, who owns a vehicle customization shop, offered a custom-paint job for the clear mask and Parker joked that Bonner could `’scare Durant” with it. Jeff McDonald of the San Antonio Express-News jokingly asked if the injury ends Bonner’s hopes of a modeling career once his NBA days are over. `’I can still be a hand model,” Bonner said.